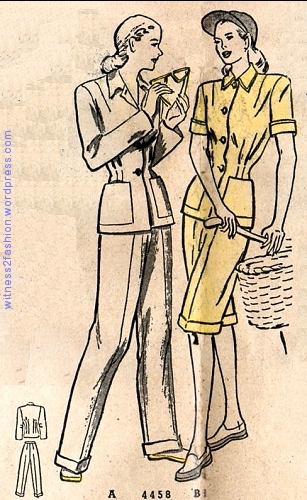 Beach wear and a pants suit, Butterick Fashion News flyer, March 1938. 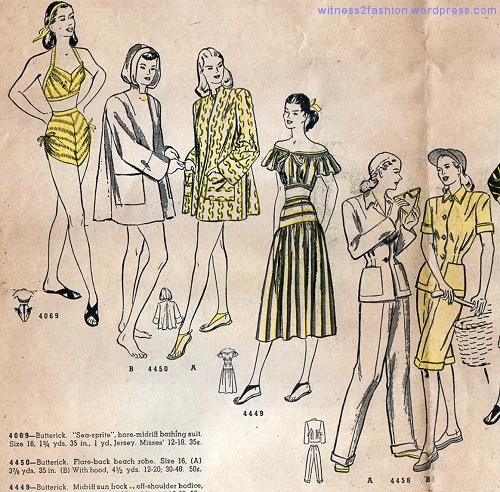 All the “pant suits” for women — actually trousers with matching jackets (called slacks suits) — in this post are from Butterick Fashion News flyers, given away for free in pattern stores. Trousers with matching jackets for women are always shown with other resort wear or beach wear, as in the illustration above. 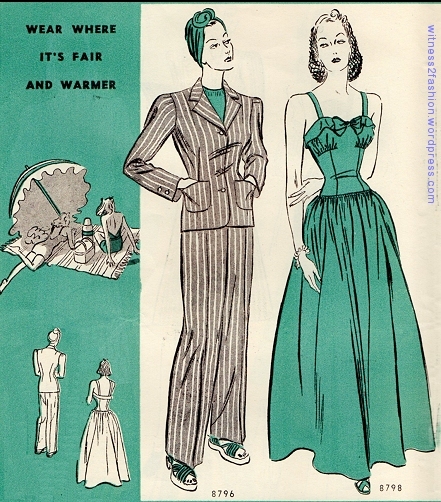 Butterick 7756, March 1938. Pattern for slacks, jacket and shirt, sizes 12 to 20 and 30 to 40 inches bust. This trim jacket would also look at home with a skirt; sharkskin fabric was recommended. The cuffed trousers have full, straight legs. 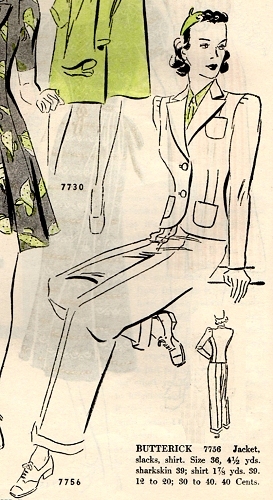 Butterick (pantsuit) slacks suit 8796, February 1940. To be worn “where it’s fair and warmer,” this mannish chalk-striped trouser suit is shown with very broad shoulders and casual sandals — and painted toenails. The evening gown on the right, Butterick 8798, is shown with a snood on the model’s hair — possibly the influence of 1939’s blockbuster movie, Gone with the Wind. “With the increasing approval given to slacks by fashionable women everywhere, you can wear the pants in the family. These have a band with suspenders attached (optional) and a fitted, classic tailored jacket. Sizes 12 to 20 and bust 30 to 42 inches.” Flannel (i.e., wool flannel) was the recommended fabric. Butterick “slacks suit” # 4458 with optional long shorts. March 1948. Butterick Fashion News flyer, March 1948. 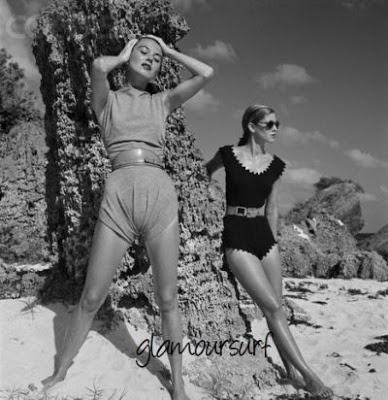 The “sea sprite” bare-midriff bathing suit (top left) has shorts that draw up on the sides, probably inspired by Claire McCardell’s Pantung Loincloth swimsuit of 1946. 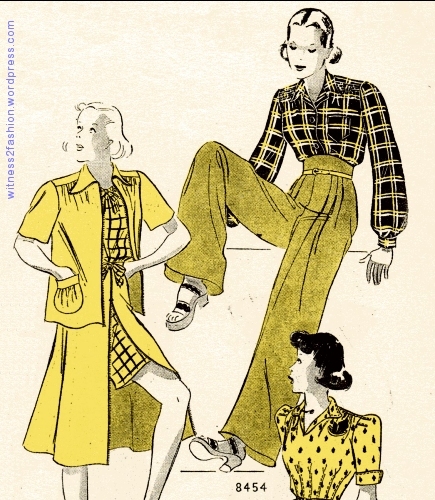 Butterick trouser pattern #8454 , July 1939. 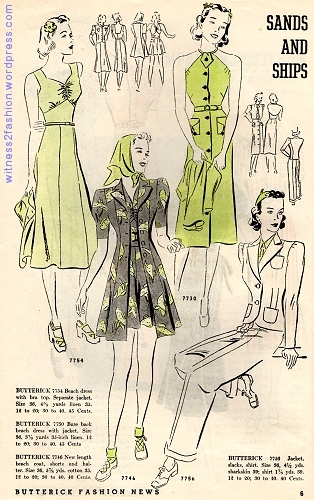 The playsuit to the left is a different pattern, #8475, as is dress #8494, on the lower right. These long, full-legged and high-waisted trousers evoke Katharine Hepburn, and come back into fashion every once in a while. When they do, I always buy a pair! Sadly, the culottes are not illustrated.